What is the difference between ‘across’ and ‘over’? What is the difference between ‘along’ and ‘through’? What is the difference between ‘above’ and ‘over’? What is the opposite of above? What is the opposite of over? When are they used? We use both across and over to talk about a position on the other side of a border, bridge, river etc. It is more usual to use across to talk about something as a flat surface or area. We use over to talk about reaching the other side of something that is higher than it is wide. Note that we can say all over but not all across. We prefer right across instead. We use along when we talk about following a line of some kind. We can use either above or over to say that one thing is at a higher level than another. 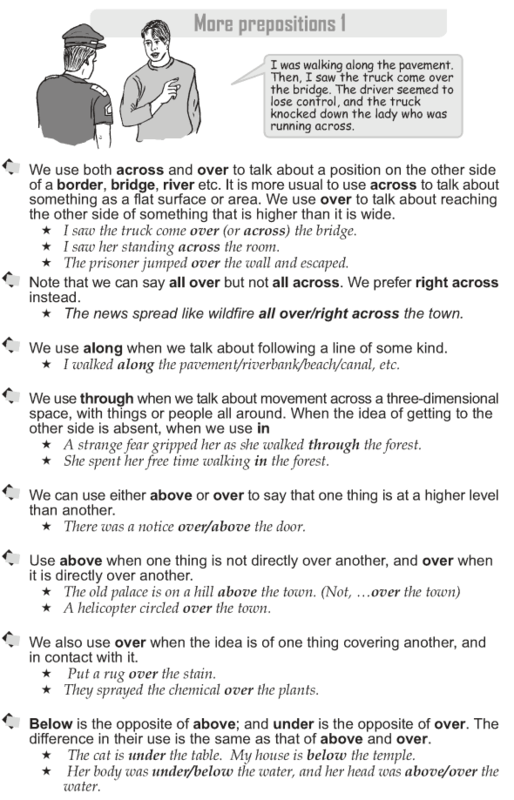 Use above when one thing is not directly over another, and over when it is directly over another. We also use over when the idea is of one thing covering another, and in contact with it. Below is the opposite of above; and under is the opposite of over. The difference in their use is the same as that of above and over.